Riders, start your pedalling: one of B.C. 's most challenging bike events beckons you this weekend. The 2013 GranFondo Whistler is a grueling, 122-kilometre ride along the Sea to Sky Highway from Vancouver to Whistler that's expected to draw as many as 5,000 participants on Saturday. They set off at Thurlow and Georgia Street at 6:45 a.m. before climbing 1,700 metres through West Vancouver, Lions Bay, Squamish and finally into Whistler along a car-free section of highway that provides a clear path into the resort. The route's final stretch is the toughest, says GranFondo Canada president Kevin Thomson. Once riders pass the "Welcome to Whistler" sign, they still have about 10 kilometres of uphill climb left to go. "It is the most brutal part, because you think you're there but you're a long ways from home," Thomson says. Spectators in Whistler cheer cyclists on as they reach the finish line, where riders can enjoy a massage, an awards ceremony and a series of small concerts in the village. It's a tough ride, but Thomson doesn't want anyone to think they can't pull it off: "All you have to do is choose to do it." Thomson got the idea for a massive cycling event in B.C. in 2007, when he traveled to South Africa while working as director of operations for the BC Bike Race. There he learned about the Cape Argus Pick 'n' Pay Cycling Tour, a cycling event that blocks road access for 250,000 wealthy residents so that up to 35,000 riders can travel a beautiful route from Cape Town around the Cape Peninsula and back. "What I noticed in Cape Town is when they shut down for a sporting event is that crime goes down, energy usage goes down, community spirit goes up," Thomson says. "All the great things that give a vibrant community even more buzz is caused when something affects everybody." Thomson later met with Neil McKinnon, his partner in a sport event planning company, who had participated in a similar event: Italy's Nove Colli, a 200-kilometre race that draws as many as 12,000 riders. "We just looked at each other and said, I wonder if that would work here in Canada," Thomson says. One day they traveled the Sea to Sky Highway while it was under construction for the Olympics and it hit them: "That was the magical place." Kevin Falcon, B.C. 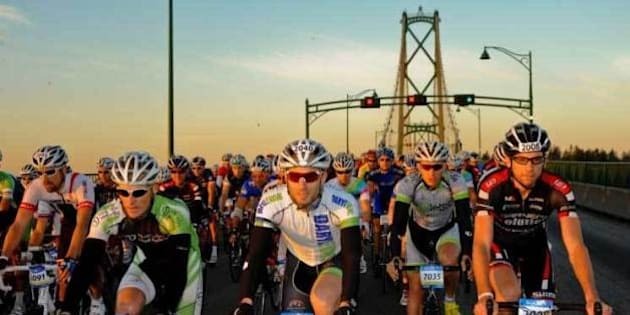 's minister of transportation at the time and a cycling enthusiast himself, gave the organizers permission to use the Lions Gate Bridge and one lane on the Sea to Sky Highway for the inaugural GranFondo in 2010. The event drew 4,000 cyclists to Whistler on a traditionally quiet September weekend in 2010, a number that grew to 7,000 in 2011. "For Whistler, you know, physical fitness is tremendously important, and so is tourism," Thomson says. "This has changed their second weekend in September from a fairly low occupancy rate to one of the highest of the year." The event's success in Whistler has allowed the organizers to host events across Canada. Banff has hosted two GranFondos, while Niagara Falls will host its first on Sept. 14.